Most people I know watch Top Chef religiously. I am not one of those people. I am also not what is referred to as a “foodie,” that childish euphemism for gourmet that not only perplexes me but also perplexes my wickedly talented pal Wendy McClure. (“Foodie” sounds way too much like “doggy” or “horsie” to take a person who uses that term to describe him- or herself seriously.) 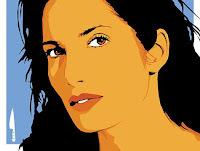 So there was no better writer in the world to interview Top Chef host Padma Lakshmi than yours truly, right? Enjoy my latest Q+A for Time Out New York. Posted on April 16, 2008 by johnsellers	This entry was posted in Uncategorized. Bookmark the permalink.